I have written a blog on repair of gauged earlobes in the past ( https://niamtu.wordpress.com/category/earlobe-repair/) and was recently involved in a news story on NBC 12. Anchor Curt Autry discusses the societal impact of earlobe expansion and interviews two female patients on what let them to expand their earlobes and why they had them surgically corrected. The story provides good insight into the practice of earlobe gauging. Cosmetic facial surgeons frequently see patients with keloid scars. There are many types of scars. Hypertrophic scars are those which enlarge within the boundaries of the original scar and keloid scars are those that enlarge outside the boundary of the original scar. Due to this, keloids can become quite large and disfiguring. Although any race can develop keloids, they are most common in darker skin types. The actual cause of keloids remains unknown but they frequently develop as a response to irritation, such as ear piercings, traumatic lacerations or surgical incisions. Some areas of the body are notorious for forming keloids such as the earlobes or the sternum (breast bone) in open heart surgery incisions. Over the years there have been many different treatments for keloid scars. Although it is tempting to merely excise them, they will most often return with a vengeance, growing larger than the original keloid. One of the most simple and frequently effective treatments for keloids is injection with an anti inflammatory steroid such as Kenalog (triamcinalone). This causes the keloid to shrink and repeated injections can be quite effective in softening and reducing the size of the keloid. A chemotherapy drug called 5 flourouracil can also be mixed with the Kenalog for even more scar dissolving power. Sometimes injectable steroids are quite effective and can dissolve the entire keloid. The patient above was treated with Kenalog injection only. Another method of treating keloids is to surgically excise the keloid and begin immediate injection of Kenalog. I have used this technique on smaller keloids with good success. The most effective method for treating larger keloids is to surgically excise the keloid, then proceed immediately to the hospital for a single radiation to the area. This has been my most successful treatment for very large keloids. Although it is impossible to guarantee the the keloid will not reoccur, the combination of surgical excision and single dose radiation has been a very positive treatment in my practice. The above keloids was treated with surgical incision and immediate single dose radiation. This treatment is frequently covered by insurance. Although it seems like a minor problem, thousands of people with pierced ears have torn earlobes and with the popularity of body piercing the number will surely grow dramatically. The torn earlobes can result from the continual wearing of heavy earrings, trauma, getting earrings snagged on phone cords, pull over sweaters, bath towls, hairbrushes or children pulling them. The actual tear may be a partial tear or a full thickness tear that completely splits the earlobe. Torn earlobes bother patients from a cosmetic standpoint as they are unattractive and also because the patient either cannot wear earrings or the earrings tip or move out of place due to the large hole. 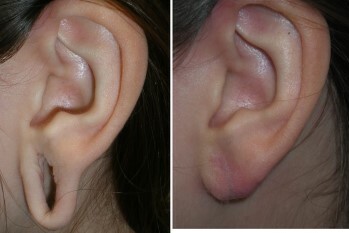 The above image shows a partial earlobe tear. The repair of torn earlobes is a very simple process that takes about 15 minutes. Local anesthetic is injected in the earlobe to make it numb and depending upon the severity of the tear, there are several means of fixing it. Partial tears are treated by cutting out the pulled apart area and resuturing the hole. Total tears require a bit more surgery and are treated by excising the borders of the completely torn earlobe and placing dissolvable sutures on the front and back of the ear. Dr. Niamtu has publilshed several articles on this procedure in the maxillofacial and dermatologic literature and was the first to publish a method on simultaneous piercing. SInce most patients don’t want to go without wearing earrings, Dr. Niamtu can repair the tear and at the same time place a special sterile earring stud through the stitches so the patient can heal with the new earring in place. 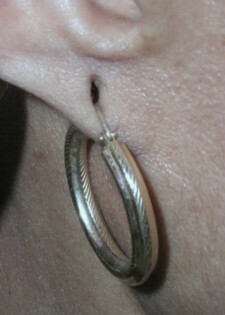 Although the technique is simple it requires finess to properly line up the earlobe to have a natural curve and shape. Dr. Niamtu also performs laser or radiowave surgery on earlobes that heal wiht a notch which sometimes happens in the best of hands. The recovery is also simple. Generally dissolvable stitches are used and the patient can resume normal activities that do not place tension on the ear. The stitches dissolve in about a week and a fine linear scar is visible for several weeks and generally fades to an acceptable result. For the suture scar that does not heal gracefully, Dr. Niamtu will resurface it with the CO2 laser which dramatically improves it. 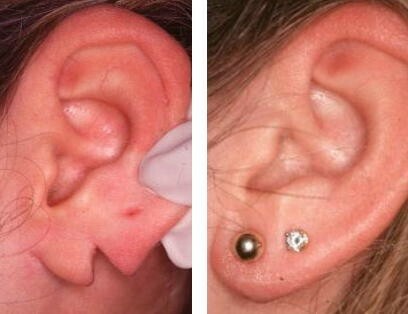 If the ear is not pierced at the time of the surgery, the patient generally waits about a month to repierce the ear. Dr. Niamtu also performs earlobe reconstruction on “piercings gone bad” where people intentionally stretch the earlobes or susain disfiguring tears of the ears or lobes from body piercng. He also treats keloids of the earlobes. Finally, many patients are born with very large earlobes and Dr. Niamtu frequently performs earlobe reduction in these patients to reduce the size of their earlobes. 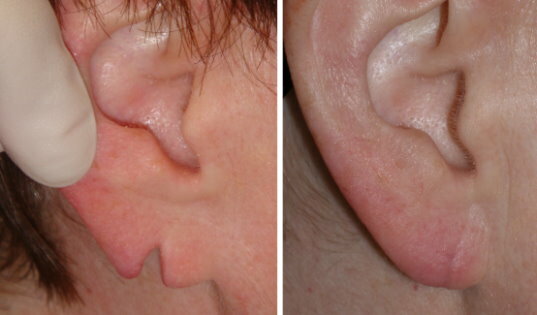 The above pictures show several cases of earlobe repairby Dr. Joe Niamtu in Richmond, Virginia. For more information about earlobe repair, earlobe reduction or earlobe keloids or other cosmetic facial surgery procedures see www.lovethatface.com.